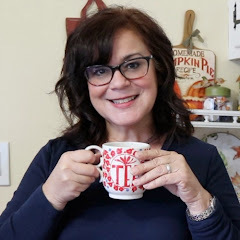 I'm excited to join Claudia and Brenda in their defending the small house series this week as they share ideas on how to decorate a small house for the holidays. 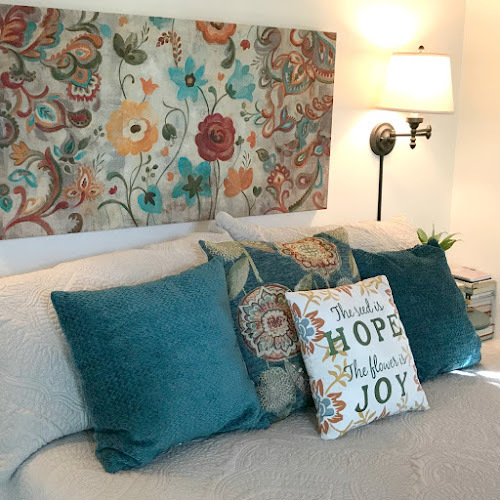 I thought I'd list the top five suggestions that have worked for me in our 1400 square foot cottage. 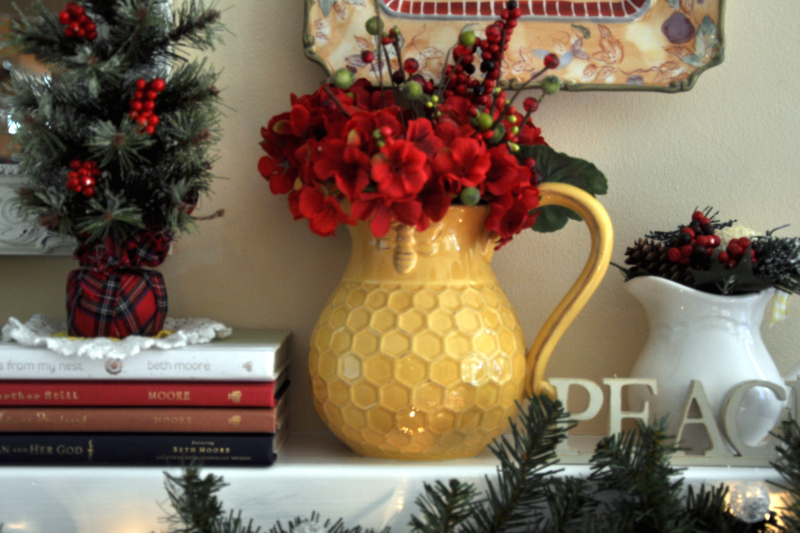 #1 - Incorporate your Christmas (or any holiday for that matter) decorations into your existing color scheme. 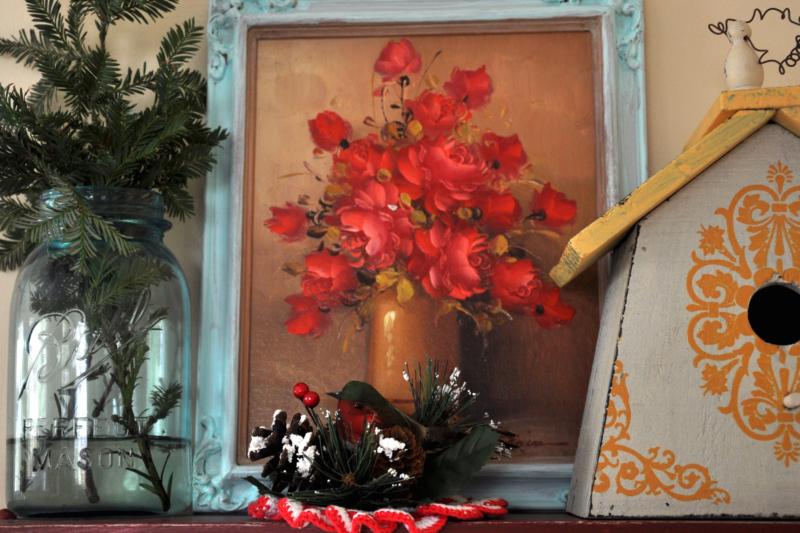 Our little cottage is predominately warm colors so traditional reds and golds suit my seasonal style perfectly. I can't imagine trying to work silvers and blues into my holiday decor without a major over haul of our furniture and I don't have the time or budget for that. Besides with all the wonderful blogs out there I can find any color of the rainbow to admire gorgeous Christmas decorating in. #2 - Tuck your decorations into your existing displays. Storage is usually a premium in small houses and boxes and boxes of seasonal decor take up a lot of closet/garage space. If you stick to your usual color scheme, it's easy to transform what you already have displayed into beautiful holiday decor with just a little imagination. 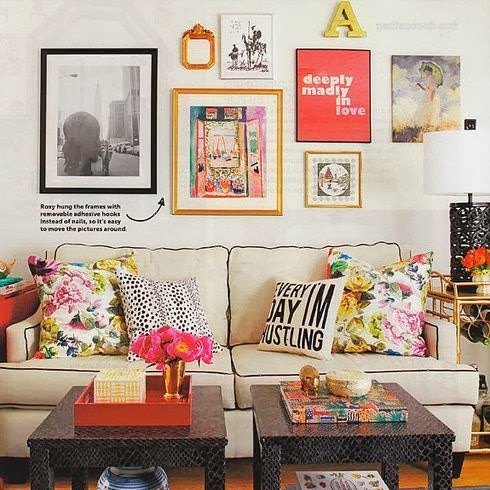 #3 - Cover your existing throw pillows with holiday fabric. I sewed simple slip covers to make couch pillows in coordinating Christmas fabrics and just used a hand sewn slip stitch to close them up. When the holidays are over I just need to snip the thread and remove the covers until next year. 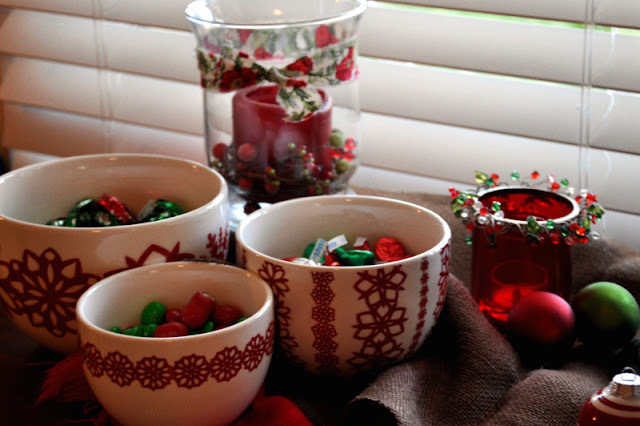 #4 - Use seasonal candy as part of your display. I keep a candy station out year round and as each holiday rolls around I change out the candy to match the season. #5 - Edit your decorations at the end of each season. If you're like me it's hard to resist one or two new Christmas decorations each year and without a little purging you will soon have more totes to put away than you took out. 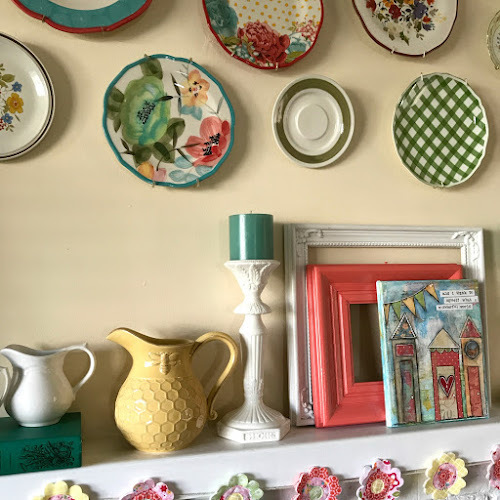 If a decoration hasn't been displayed in a few years and it doesn't hold any sentimental value, consider passing it on to someone just starting out their collection. Small house or large, for me it's all about sharing your home and hospitality with those you love. Perfection will probably never be attained, so open your house up as it is, life is too short to wait till next year. Great tips Patty. I agree! Love your home, it's very cosy, nice Christmas decorations too. These are wonderful decorating tips! Thank you so much for sharing them with us. I just love your home (I still have my eye on that painting!) It's warm and inviting. You use color beautifully. Great tips and you home looks very festive. I actually prefer a small house. Patty, these tips are right on the money--I have a small home, too! I especially love the pillow ideas and your buffet is gorgeous!! Beautiful home! I've started a small collection of white ironstone pitchers. I'm going to go get some greenery and maybe some candy canes, to make them festive! I love it all! 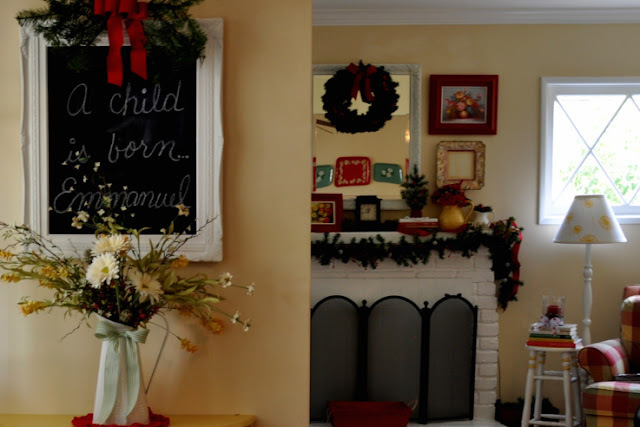 I wish I could find a lovely frame like you have for your chalkboard. And then there's your other pretties I so envy! Great idea on those pillows. 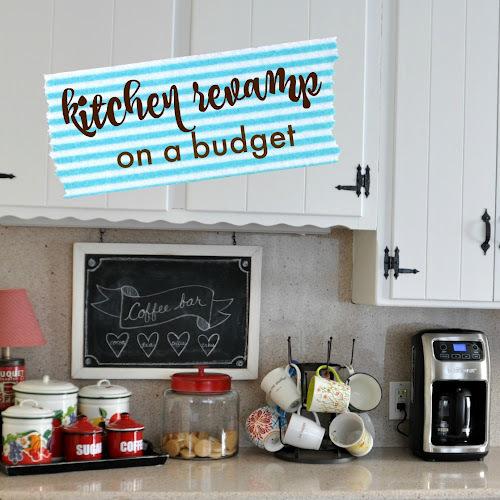 Hi Patty...these are wonderful tips for those of us with small homes and for those with large homes as well. I learned to use what I had on hand here at our little farm cottage after moving from a HUGE old Victorian home with full basement. That home was packed to the 'gills' and our tree had been a 9'high and very wide tree that was LOADED with ornaments. With only a small partial basement here in the country we didn't have room to store everything so I had to carefully edit what we had. What we don't use is stored in one of our buildings waiting for a garage sale one day ;) Your home looks so cozy and inviting...just beautiful! As a small home owner.....I know the challenges and the joys! I love your buffet and the tea pot on it. Your house is indeed very cosy and warm. You've shared some great tips for houses of all sizes. I like our small bungalow, it's cozy. Excellent ideas. 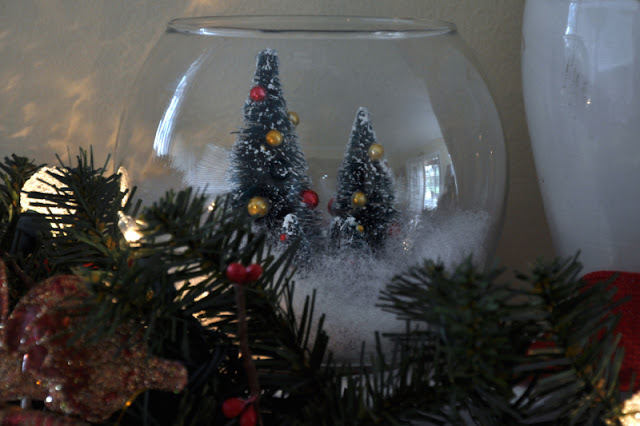 Your house looks lovely and I love you trees in the fish bowl...so cute! Great suggestions Patty! I also recover my pillows for the season. It's such an easy way to change the mood of a room and the covers are easily stored. Your home is so warm and inviting... the perfect kind of home to cozy into on a rainy day! Your blog is so wonderful... I look forward to visiting again soon! We have an 1100 sq ft farmhouse cottage. I totally know what you mean. I got rid of alot of older Christmas decor and kept it quite simple. 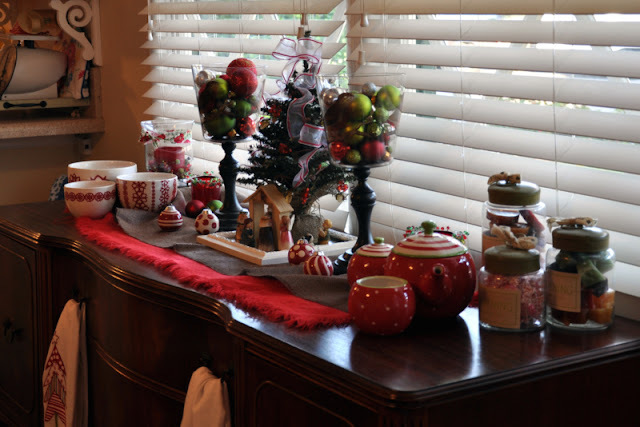 I love what you did with your buffet, and how you incorporated your Christmas items with your existing decor. Good idea! I'm really enjoying the "small house" series- I need it!